If you didn't already know, I am currently in England for a semester study abroad program. Although I've only been here for a month, I've been preparing for over a year, and in that time I've amassed quite a few helpful resources. I thought I'd share them here incase any of you are thinking abut study abroad so you won't make some of the same mistakes I made! I'm grouping these tips in 3 categories, Phone/Service, Travel, and Helpful Apps/Websites. There are SO many resources out there, but I think this list covers a pretty good span of things you'll need and want to know! Phone/Service Put phone service on hold This is one of the last things I did before I left. I didn't even know it was an option until I called Verizon and asked about an international plan, but they told me about putting my service on hold instead. It's relatively painless, you just log in to your account, pause your service, and then it turns back on in 90 days, at which point you pause it again, if you need to. It can be turned back on manually at any time if you need to, and you can still use iMessage and all that when you're on wifi, but you don't get billed for service while you're away…it's awesome! I'm know that AT&T does this as well, but if you aren't with either, just call your provider and ask! Unlock old phone I brought an old phone to England with me, but I had to unlock it first, in order to get another sim. This was a bit more tedious than pausing my service, just because I had to go online and request an unlock and then sync my phone to iTunes in order for it to restore itself, but after that, everything worked fine! Again, just call your provider to ask them how you should go about this, because it is definitely worth it! Giffgaff sim Although there are many companies that you can purchase a sim card from, I went with GiffGaff and I've been really pleased. You order things called "goody bags" once a month, and that's how you choose how many minutes, texts, and gigs of internet you want. I really like that you have the chance to change it up each month if you want more or less and the plans are very well priced. As far as international minutes go, they only charge 3p a minute, which is super cheap compared to other companies rates. If you're in the US and would like to order a sim, you can do so here. I ordered mine from that link and it arrived in two days, which is incredible, so I'd recommend it. Travel Visitor Oyster Card Obviously, this one is only relevant to people visiting London, as an Oyster card is the card that you put credit on to use on the tube and the buses. I would 100% recommend getting one of these and putting money on it before you even get to London, although you can top up at any tube station. It made traveling in London so much easier and more wallet friendly because after a certain amount of journeys, it caps you off and doesn't charge you anymore. Because you generally use the tube to get everywhere in London, it is seriously so worth it. I got 40 pounds preloaded on mine and I still have about 10 pounds left after 4 days in London. Eurail and Britrail pass I bought both passes from STA, and I fully plan to use my Britrail pass, but to be honest, I will probably return my Eurail. Not because I don't think you get a good value for money, because if I had the time I'd absolutely use it, but because trains take much longer than I previously thought, and I don't really have the time to waste on a train. I've found flying on a budget airline to be about the same price, but much quicker. However, for staying in England, trains are definitely easier and quicker, so I'll be using all of the days on my Britrail pass. RyanAir Okay, this is a love hate relationship. Love because I can get flights from Manchester to Dublin for 19 pounds, but hate because they literally charge you three time that if you mess anything up or need to make a change to your ticket. Definitely worth booking your tickets with them, but double and triple check all of your details before you book and make sure to call them within 24 hours if you make a mistake, because then the fines will be much less. The Train Line This is the website I use to book all of my train tickets. There is a UK branch, but also a Europe branch, and the prices are really, really good. For instance, I can get a last minute ticket to London for about 20 pounds, instead of the 70 a train station would cost me. STA travel This is the website that I used to book everything before I got here. They have some really good deals on flights, hostels, hotels, and rail passes and you only need to be a student or teacher to qualify for them. Also, their customer service department is really helpful and quick, which is invaluable when you're stressing over things that need to be perfect and also happen to be extremely expensive. HostelWorld Although STA has a number of hostels on their website, Hostelworld sometimes has more for even cheaper. Now, when I'm at home, I'm quite spoiled to my bed and my huge room, but I'm 100% okay with roughing it while I'm here, and I've been able to find some seriously cheap but not shady looking hostels with this website. I haven't stayed in any yet, but if it turns out that they are skeevy, then I'll let y'all know. Other Helpful Apps/Websites Skyscanner and Bus2Alps To be fair, I never really use these apps personally, but I have them and I think they're good options if you have a bigger budget. Skyskanner does exactly what it implies, scans all of the flights in the period of time that you're looking at and then shows you the cheapest option. The only problem is that nothing is cheaper than Ryanair, so I don't see a reason for me to use anything else. Bus2Alps is a company that puts together weekend trips and week long trips to different places in Europe and they're actually quite fairly priced. I'd recommend it if you're studying near to one of their "ports" which are located in Europe, not the UK. Polagram I love this app. It can be a bit expensive, but you can't beat the convenience. You can download the app, and then pull photos from your camera roll or Facebook and Instagram and then they print them and ship them right to your door. Because I got here and had no clue where to go to print photos, this was a great way to print a few and have them delivered to my hall. However, if you're wanting to print hundreds, Snapfish would be the better option because when you print 50, you get 100 free! The Abroad Guide This is a blog that students that have previously studied abroad contribute to. 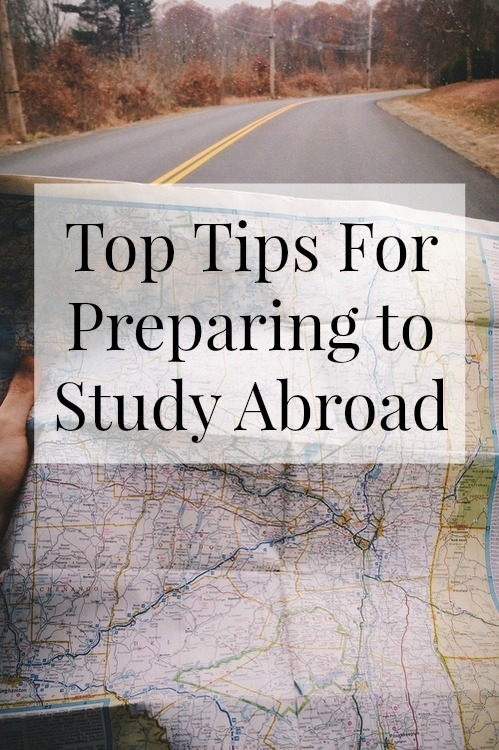 They have really helpful tips on everything from what to do in certain cities to how to save money or things that you have to do no matter where you study. Although I'll be writing up my own packing list soon, they also have a really good basic one that you can access once you subscribe. I generally use this before I take a weekend trip when I want to plan my days. I'll be uploading a packing list as well as my packing tips later on into the semester, but I hope this helps you to prepare if you're planning to study abroad!